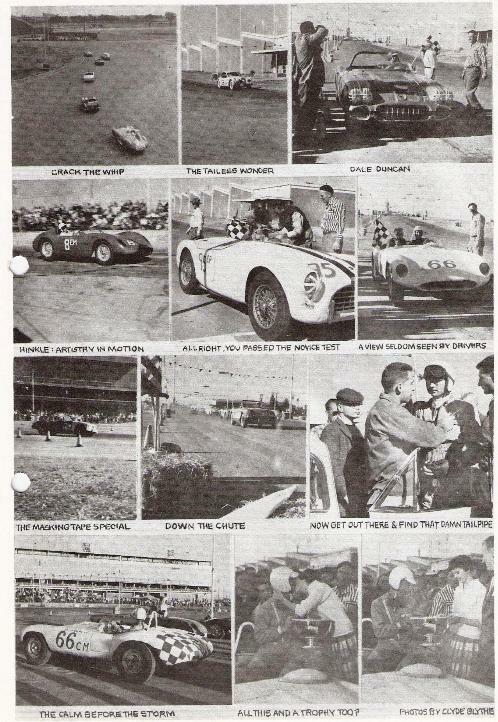 Editor's Comments: Even though Oklahoma Region held its first race in 1952, by 1958 it had become a "Rally Region." Even the races held at Stillwater were conducted by Northeast Oklahoma Region. 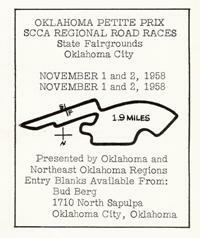 This changed in November, 1958 when the first "Petite Prix" at the Oklahoma State Fairgrounds was held. 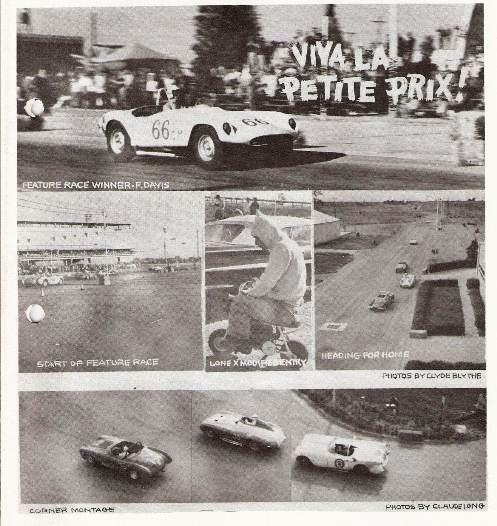 The last "Petite Prix" was held in 1962. The long awaited and much discussed race is no longer fancy nor pipe dreams To you who attended the last business meeting this is no news, but for the benefit of the majority of the club members (the non-attenders) have joined forces with the NEOKLA Region to put on the race. The fine people to the north have agreed enthusiastically to furnish their wealth of experience and know how as well as much, much plain old sweat of the brow to make this a success. For this they will get half of whatever the SCCA profits may be. Believe me, this is the best bargain that we could wish for. 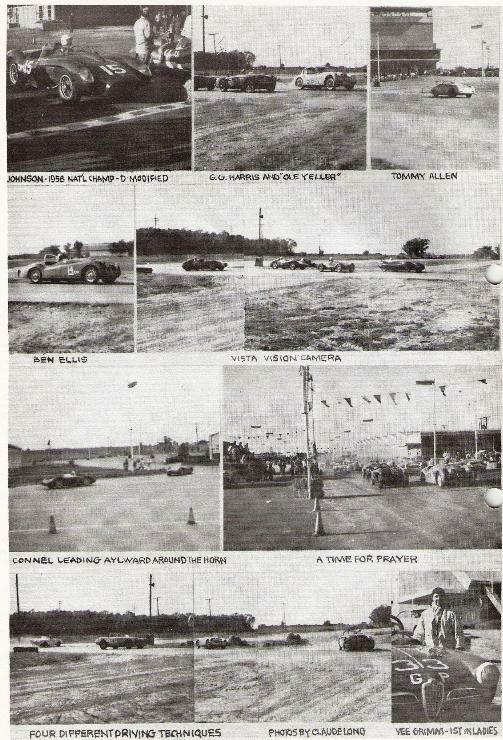 Many of the older members know that the Oklahoma region was once all the state of Oklahoma and that the northeastern group broke away and formed their own region because, mainly, they were a racing group and we were a rallying bunch and really had nothing in common. Perhaps it is a coincidence that this race is bringing our two regions to a much closer understanding than we had even when we were one. Let’s take advantage of the situation and show the Tulsa and Northeast people that we are nice folks too. One of the best ways that this can be done is simply be available when you are called upon, or better still volunteer and then put forth every ounce of effort you have to make this race as successful and as well run a race as those which we have attended at Stillwater. The people from Tulsa will assist (?) in every position and show us how it is done, but we will need many, many willing workers. The reason for the (?) is simply that I presume that with our lack of experience the NECKLA ites will be doing most of the work. But, let’s get out and make this race a howling success. We’ve talked long enough, now all you have a chance to do some of the doing. Attend the business meetings, find out where you can do the best job, don’t be wallflowers, get into the act and have fun. I would like to tell you all just how much Dean Knight, RE, NEOKLA and the charming Mrs. Knight have offered of their own services and of their club’s services, but I’m half afraid that if word gets back there may be a mutiny. One final thought, the people who work the race should be able to participate in their particular event, so all you who have aspired to race, but are afraid that working may keep you from it, tain’t no excuse !l Novice races will be run. An interesting thought for the neophites, you can get immediate delivery on a new 3 liter Ferrari GT in LA for only $12, 500, plus extras and freight and tag and tax, etc., etc., etc. With this happy thought, I leave you, and see you ALL at the meetings. In closing I certainly want to thank the Neokla Region for their help and also the many, many people outside the two regions whose help was certainly appreciated, and to D-X Sunray for furnishing the one thing we could ha had no race without - gasoline. I think the region’s competition drivers should take a bow along with the regions novice drivers. Outside of a little flag trouble (Homer thinks the yellow flags should be bigger), they all drove heads up races. Contrary to rumors Tommy Allen was not black-flagged for passing under yellow flag conditions. A big hand to Tommy, Homer, Bob Simons, Bill McCain, Ben Ellis, Jim Jorski, and Phil Hunt. Viva la Petite Prix!